Artist, freelance illustrator and educator Andrew DeGraff (creator/illustrator of Plotted: A Literary Atlas, and Cinemaps: An Atlas of 35 Great Movies) has been mapping places, stories, events, books and films for a decade. Through a combined tour of art, cartography, and his own work and influences he explores the boundaries of reality and fiction, the necessary fictions of mapping, and the realities that inform the process. DeGraff graduated from Pratt Institute’s Communications Design program with a focus in Illustration in 2001. He returned to Pratt to teach illustration from 2009 – 2014 and now teaches at the Maine College of Art. He recently published his second book, Cinemaps: An Atlas of 35 Great Movies from Quirk Books. Andrew has worked as an illustrator for clients such as: Visa, Sports Illustrated, Kellogg’s, The New York Times, GAP Kids, Anthropologie, and Leo Burnett. His gallery work has been shown in New York, Albany, Philadelphia, Chicago, San Francisco, Los Angeles, Honolulu, Calgary, Mexico City, and the Philippines. Let us know if we can make arrangements to assist you in accessing Houghton. Email or call 617-495-2441. 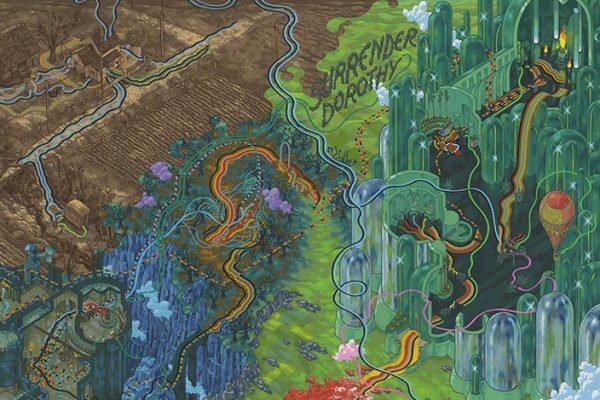 Images courtesy of Andrew DeGraff: “Paths of Oz”, from Cinemaps: An Atlas of 35 Great Movies (2017).